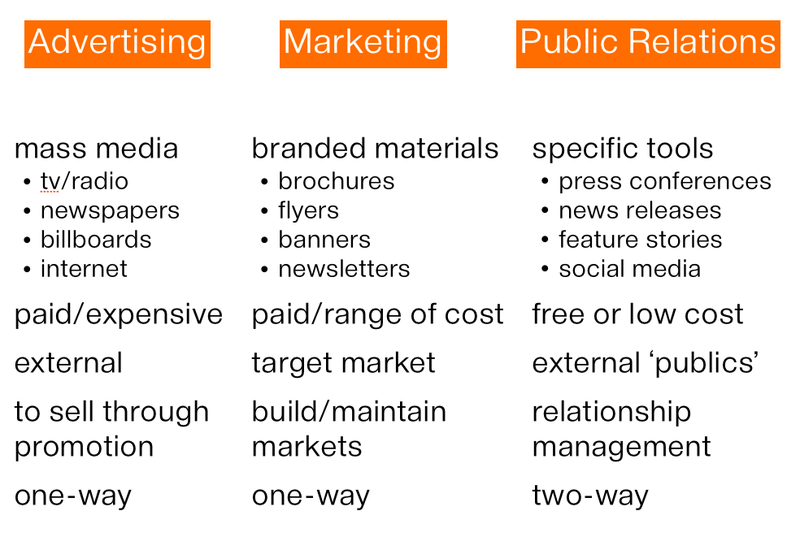 Advertising vs Marketing vs PR: Know the Difference. The Digital Do-Gooders met for the last time this week and we talked about the difference between Advertising, Marketing and Public Relations, three related but very different activities for promoting your organization. Three principles sometimes used to explain the difference are Control, Cost and Credibility. When you create an advertisement you control the content, the cost is typically high and credibility can be questionable because you’re the one telling the world how great you are. On the other hand, when you engage in social media (a function of PR), you lose control because you’re inviting two-way dialogue (hopefully!). But, the cost is low and when others tell the world how great you are, credibility is extremely high. Most organizations should consider using a blend of all these tools to help raise awareness and promote their organizations. Your budget, available talent, and buy-in of leadership will all impact how you balance these. When was the last time you asked a donor or volunteer how they felt about your website? Ever? 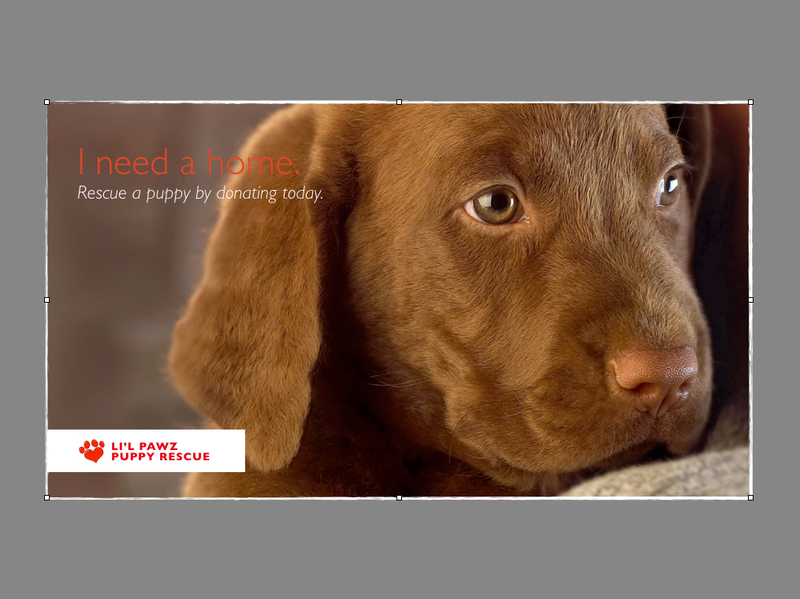 The biggest mistake non-profits make when planning their websites is imagining they are the target audience. Every day I see non-profit websites with navigation based on the organization’s departments and programs, overflowing with content written by the bossiest department/manager/staff who determine the priority – often their department or program. Important element #1: Figure out what your visitors are looking for and organize your site’s navigation with that in mind. Hint: ask them. A website refresh needs to begin with a look from the perspective of your audience – your donors, supporters, activists, volunteers and people in the community who don’t yet know you. Important element #2: Determine what your visitors are interested in and develop content around that. Tell stories about how you’re making a difference. Important element #3: Simplify, simplify, simplify. Less is more. Navigation should be intuitive and reflect what your audience expects to find. A visitor should know within an instant of landing on your homepage where to find what they’re looking for. Or they’ll leave. Important element #4: Be beautiful. Visual design is powerful. Use it effectively. You have a split second to pique a visitor’s interest when they land on your site. Be compelling. Evoke an emotional response through images and stories. Make it easy for your visitors to find what they’re looking for by providing clean, clear navigation and minimal text. How do you achieve that? Seth Godin said it best when he advised organizations to “fire the committee!”. A group of people cannot build a great website. Either hire a really, really talented professional or appoint someone in your organization with creative talent and organizational skills to be the “Official Website Coordinator”. They report back, ensure milestones are met, research and confirm content. 1. Evidence of your organization’s passion. Share compelling stories about what you’re doing. You want them to care. Make people cry. Or make them laugh. 2. Tell your visitors who you are and what you do. You have 10 seconds. Go! 3. Clear opportunities for your visitors to engage with you—volunteer, attend an event, sign a petition, join the movement, take out membership, give. 4. Social Links to your social media sites—Facebook, Twitter, Instagram, Flickr, Pinterest—where visitors can connect with you. 5. Lots of images showing how you’re helping, of your volunteers and staff in action and of how you engage with your community. 6. A big, shiny donate button with clear reasons why they should. You have 10 seconds. 7. Email sign up so you can communicate with people who are ASKING to be kept informed about your organization. They already like you, feed them! 8. Show where the money goes. Want a few more ideas? Check out my previous post on communicating your brand. What sites would you add? The 3 Fatal Flaws of a Non-Profit Newsletter! There is no end to the debate over whether to have, or not have, a newsletter. You’re time strapped, cash strapped and, very often, talent strapped, so how to justify using scarce resources to churn out yet another newsletter with questionable return on investment. Consider this. A newsletter provides you with an opportunity to communicate with your stakeholders and that’s really important. Your donors, volunteers, board of directors and staff all want to be kept informed about what’s happening at your organization. But, they don’t want every little detail, just the big picture please. 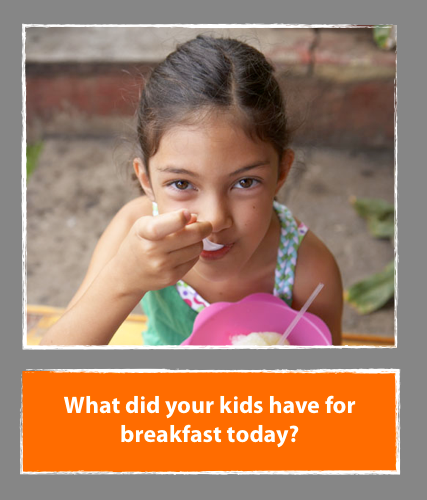 Share information about how their donation of time, money, advocacy is making a difference. 1. Don’t assume your audience is interested in what you want to tell them. Take the time to find out who your readers are and what interests them. They don’t want to hear about how important you are. Get over yourself, and write for them. How are you providing meaning and value? Ditch the jargon. 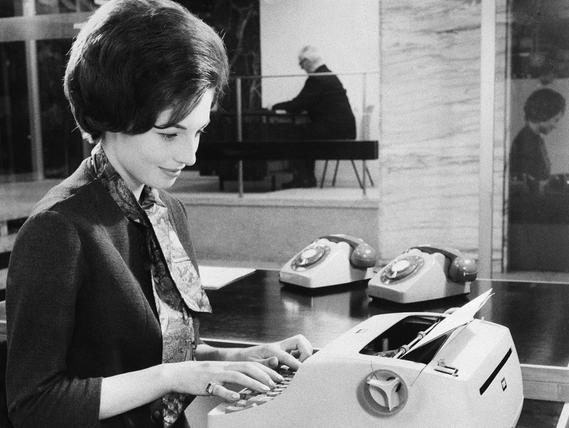 Forget about how excited you are for your Annual Report–they’re not. Tell them why it matters that they support you and how they can connect to your cause. And keep it short and sweet, you have about a nanosecond to engage them. 2. Be relevant and be interesting or your newsletter will hit the trash before you can recite your 10-second mission statement (or stuffed, unread, into the recycle bin!). Sit down for 15 minutes and create an editorial calendar that will help you identify seasonal themes that you can wrap your content around. Your donors and volunteers have given to you (or hopefully will! ), so give back to them. Ask yourself how your content will make your reader feel. How your article will help make their day, their lives, better. Be conversational. Be personal. Be generous. 3. Stop churning out that semi-annual newsletter with recaps of what you did over the past six months. That’s not a newsletter, it’s an archive. And please don’t email it out as a pdf. Yawn. It’s 2013 so yes, you probably need to go digital. If you’ve got more than 25 subscribers, sign up for an email newsletter service provider (ESP) to help you create a nice clean template with consistent spaces where you can drop your delightful and engaging content. If you don’t have the talent to do it in-house, hire someone and get it done. Finally, don’t forget to include a call to action. You’ve convinced your audience that you matter, now tell them what you want them to do. Donate? Like your facebook page? Attend your awesome event? Volunteer? Don’t make them guess. And then thank them, over and over and over again. Need a little inspiration? Check out Toronto’s SickKids Hospital’s fantastic e-newsletter. This post is from a series of presentations I’m currently giving called “Digital for Do-Gooders: Technology to help Non-Profits Do Good Better.” Sponsored and supported by WEtech Alliance, Windsor-Essex’s Technology Accelerator. Good Grammer Rules. Even if your [sic] Taylor Swift. Taylor Swift has been taking a beating in the media lately for playing out her troubled romances in her music. And now a scandalous grammar error has been found in one of her songs. Jeesh. You’d think she’d be more careful. Ok, so Taylor can afford to look dumb and unprofessional, but you can’t. Communicating with your communities of interest is the lifeblood of most non-profits. Whether you reach out through a newsletter, your website, annual report or marketing materials, what you say and how you say it matters. A lot. Consider this. USA Today recently reported on a study of 1,700 online daters that indicated that 69 percent of women and 55 percent of men consider bad grammar a turnoff. In fact, good grammar came in right behind good teeth as the most important attributes for single men and women considering a potential partner. I hope that dispels any doubt about how much impact the words you write have on how others perceive you and your organization. So check, double check and triple check your copy before you say it, mail it, print it or post it. Let’s start with a look at words. First, it’s important to use real words, and to use them appropriately. Ditch the acronyms and industry jargon; they will not make you sound smarter and they will confuse your reader. Don’t write “utilize” when “use” will do. There is no such thing as a “mute point,” unless it’s a silent one. Don’t write “over” when you mean “more than.” “Over” refers to a physical space, as when Tom Cruise jumped over Oprah’s sofa. Their, there and they’re are different words. Ditto for too, to and two. And “your” and “you’re” are not interchangeable, Taylor Swift! There are many more useless phrases like these lurking about, ready to leap into your copy and obscure the really important stuff you have to say. Find them and eject them. Another way to ensure your readers (a.k.a. 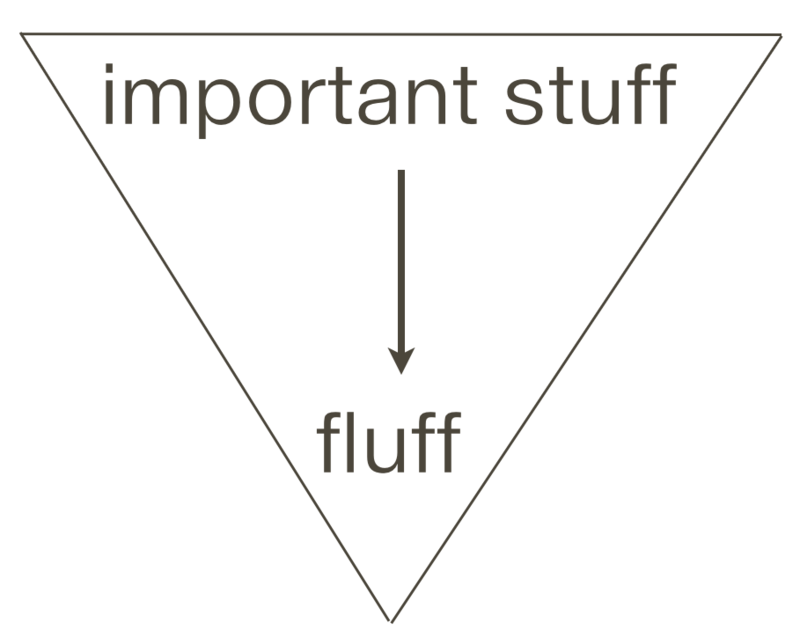 skimmers) don’t miss your message is to write like a journalist by which I mean using the scientifically proven Inverted Pyramid method of content development. All that actually means is that you begin with the important stuff –who, what, where, when and how—and leave the fluff for later since they may never get to it. 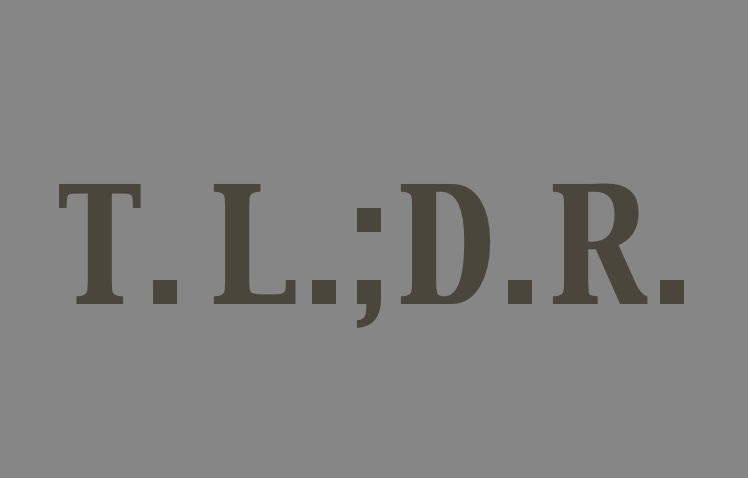 Also, be aware of T.L.;D.R. (Too Long; Didn’t Read). This is a common response used to reply to a really long text message. Don’t be that guy! Keep it short and sweet. Finally, just a quick word about punctuation. Commas are not only super cute, but they’re important little inventions that allow breathing space for your readers. Paragraph breaks (think peaceful feng shui white space), headings and subheadings are also useful techniques that help skimmers quickly find what is important to them. And don’t forget bullets, those handy little dots that help break up text into readable bite-sized nuggets. And please stop using exclamation points! Yes, your annual report looks exciting! And yes, we can’t wait to admire all those great photos you included! 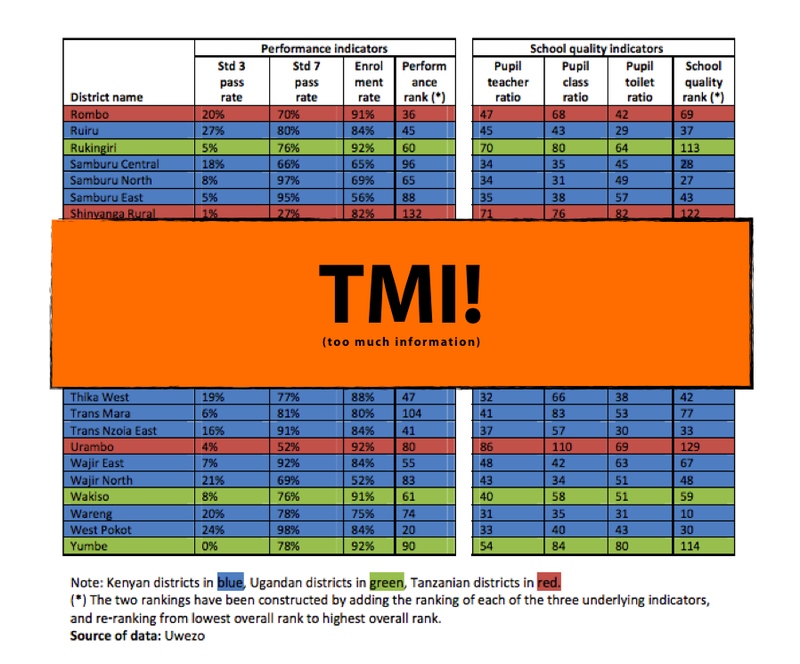 Even the data is exciting! But calm down. Please. Got it? This morning’s Digital Do-Gooder session was all about breaking down the fear of the unknown and taking the leap to find true happiness in the Cloud. Cloud technology allows us to collaborate with colleagues, clients and even share photos with family and friends easily and securely. Platforms I use a lot like Google Docs, Dropbox and Evernote, streamline processes and eliminate duplication and confusion when I’m working with others on projects and events. From an engineering perspective, the Cloud is as magical to me as electricity. I don’t have a complete grasp of how connecting a plug to an electrical socket makes things in my life come alive, but I understand enough to recognize the dangers, and flip the switches that illuminate my world. A big shout out to James Henderson from Razzlewood Business Solutions who joined me to present a live Google Docs demo and to answer some of the geekier technical questions. How are you using the Cloud to work smarter? Create Presentations that better share your Story. I spoke to a group of non-profit communicators today about how to create better presentations. We talked about simplifying the message and cutting the visual clutter. We discussed the importance of consistency, reflecting your visual brand and using compelling images to engage your audience. Throw away the templates, clip art and bad stock photography. Be professional. But still, one attendee noted that, while I was providing some terrific ideas, she was hoping for that elusive magic bullet. It’s a fair question. Working in a non-profit can mean working harder than ever with fewer resources – and something always has to give. Don’t let it be your brand. Ouch! Where to look first? The truth is, if there is a magic bullet, I haven’t found it. A good presentation takes time to prepare. A really brilliant one-hour presentation can take 40, 50, 60 hours or more to create. Yep, 60 or more hours. A great presentation simply cannot be thrown together in an hour the night before. Your organization needs one killer presentation that you can riff off of, and whether or not you have a budget for it, you need to find a way. Compelling Image and Simplified Message. What is the cost of lost opportunity? Of potential donors ignoring you? Of potential volunteers moving on to other organizations? Of potential board members opting for other opportunities? I would argue that you can’t afford not to have a great presentation that tells your organization’s story and creates awareness for your brand and your cause. For me, the only way to start a presentation is to think. 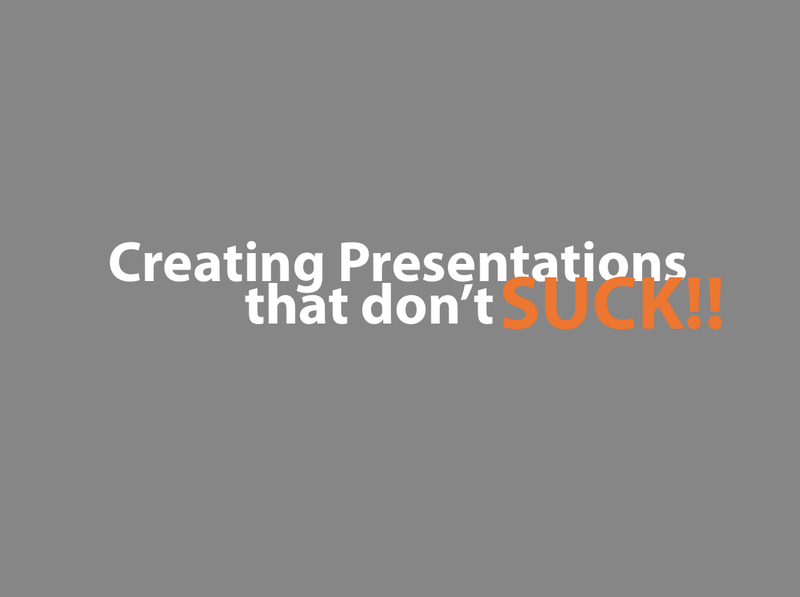 Think about why you’re creating a presentation. Think about what you want to talk about and why it matters to you. Use tools like whiteboards, sticky notes, even a napkin will do to jot down your main ideas. Know what you want your audience to learn or discover through your presentation. Simplify your design. White space is your friend. Stay visually consistent by setting visual rules (limit the colours, fonts, effects, and layout styles). Choose solid colours and beautiful fonts that are large enough to be read from the back row (Times New Roman, Arial, Lucida Console and Comic Sans are not beautiful fonts!). Yes, PowerPoint offers a myriad of themes and fonts to choose from. Resist. Resist. Resist. Engage and delight your audience. This is not done through fancy animations or text zooming in and popping out of your slides. Impress your audience, don’t confuse them. A presentation lies somewhere between a report and a good story and is meant to enlighten and inform. It may include some data supported by compelling stories to make it interesting and to create a memorable experience. Do not put all the words you want to say on your slides and then, when they don’t fit, make the font smaller. A presentation is not a prompter. People can’t read and listen to you at the same time. In fact, people read faster than you can speak so if you’re going to read your slides you may as well just go take a seat. Avoid bullet points. Ok, you can use them sometimes, but don’t overdo it. Bullets are not magical punctuation marks that possess super powers to take the place of too much text on a slide. It is just as annoying, boring and mind-numbing to listen to a presenter read bullets from a slide as it is for a presenter to read sentences from a slide. Avoid text and data dense slides that are difficult to read. Empathize with your audience. Don’t be boring (see points #4 and #5). This is about them, not you. Pretend you’re at a cocktail party. Smile. Make a few jokes. Keep the conversation light and flowing, share anecdotes that people will relate to. Don’t be that girl who drones on and on about herself. Ensure your text is readable and spelled correctly (yes, grammar matters, we’re professionals here! ), and your images consistent, impactful and well balanced. 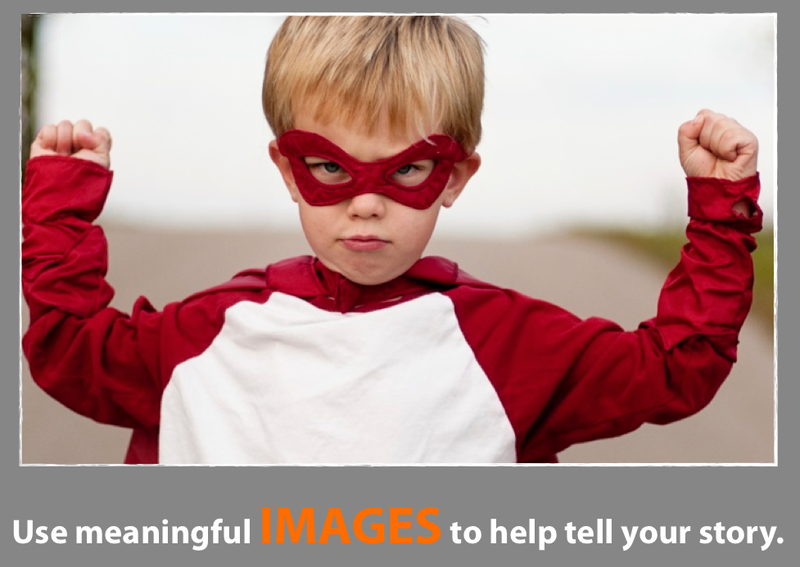 Use meaningful images to help tell your story. Invest in good photography, a picture really can paint a thousand words. Professional photography is best or, if that’s not possible, use (good!) stock photography and encourage your volunteers and staff who love to take photos to bring their cameras to your events. Images of babies, puppies are sure-fire hits. If that doesn’t work with your non-profit settle for great shots of people in action for your cause. A captivating picture really can paint a thousand words. Explore ways to share impactful highlights of your data in interesting ways other than in spreadsheets and confusing graphs. Too much data can put your audience to sleep and distract your audience from your most important message. Find compelling ways to share data that relate to your Story. When you share your stories remember to be authentic and sincere. Telling the story about one life you impacted will resonate with your audience. Use real language and show emotion to show how your organization is helping to change the world. What else do you do to create strong presentations? This is the first from a series of presentations called “Digital for Do-Gooders: Technology to help Non-Profits Do Good Better.” Sponsored and supported by WEtech Alliance, Windsor-Essex’s Technology Accelerator. Tell me and I’ll forget, show me and I may remember, involve me and I’ll understand. It may be an old adage, but for non-profits seeking to connect with supporters, sponsors, donors, and volunteers, it’s a good one to keep in mind. People are busy. They’re out there taking care of their own needs and if you want their attention you’d better have a compelling story. Shouting about how great you are, no matter how big your megaphone, isn’t going to do it. You need to buildrelationships. Building relationships means communicating. No communication, no relationship. Yes it’s hard. Resources are stretched and it’s a dilemmatrying to decide which communications channel mattersmost. In person is best but hardly feasible all the time. So do you send email blasts, direct mail, or spend time updating your Facebook and Twitter feeds? Or maybe you should start a blog? And don’t forget mobile! The fact is, no one communication channel is a silver bullet to success; you need to share your story across multiple channels if you want to get noticed. Why? Because it’s highly unlikely that your stakeholders are all sitting around together at your local Timmy’s waiting for your email to arrive or monitoring your Facebook feed. They’re busy and they’re not going to spend time looking for you which means it’s up to you to figure out how to reach them. These days, most non-profits find an active Facebook page and occasional email blasts are effective tools for letting people know what you’re up to. But your website is still your most important digital presence. It’s where people go to try to learn more about you and is often the first encounter people have with your brand—so the welcome mat had better be out! Still have doubts about sprucing up that site? Studies show that most donors visit a non-profit’s website before deciding whether or not to donate. According to a 2010report by Cygnus Applied Research*, 72 percent of Canadians give online. What’s more, a whopping 90 percent of Canadians under the age of 35 indicated that they would make online charitable donations that year. The researchers conclude that online giving has surpassed the tipping point in this country. So how is your website looking? Most nonprofits believe that their websites are not quite up to par and, havingviewed hundreds of well intentioned but poorly executedsites languishing in cyber oblivion, untended and neglected, I agree. It’s not pretty out there. So what makes a good website? First of all, you can’t do anything unless you know who you are, what you’re trying to achieve and who your target audience is. Then share your vision and inspire others by creating a compelling story about your organization or cause. And never forget that a good story has a hero your audience can relate to.People give to people, not organizations, and yoursupporters and donors must feel that they are part of your story. Overall impact and appearance. Looks aren’t everything, but if your website is having a terminal bad hair day, you’re going to have a hard time attracting new friends. Take the time to do a little research. See what everybody else is doing, discover what others are doing well and then do it even better. Content. Provide good, well written content (i.e. no spelling or grammar errors!) created with your target audience in mind. If you want to persuade people to join your cause, think about what it is about your story that will matter to them. And switch things up frequently. Why would someone visit more than once if your content never changes? User Experience. You can have the most beautiful site in the world but if your audience can’t find what they’re looking for, you may as well go home. Includea search engine and clear navigation so people can find their way around. Findability. If people can’t find you, then, well, it’s over before it begins. Sociability. It’s all about relationships, right? So have a team page with friendly photos of the gang and tell people who you are. Optimize your site for mobile devices—iPhones, Androids, and tablets—and make sure you show people where to find you on Facebook, Twitter, via email, etc. so they can socialize, connect, and share ideas and the passion you have for your cause. This post was originally published on the Ontario Trillium Foundation’s Sector in Conversation. Happy Easter Bank Holiday! Proper pie and a ridiculously huge jug of gravy - because you just can’t have too much gravy. Lovely. New hat day! Thanks for this beauty @the.hook.pusher!